Surmounted by a central eagle, floral garland, and corner vases, the overmantel, presented as an elevation, contains an antique relief of Antinous. The chimneypiece and fire screen below are decorated by garlands, rosettes, and shells. A man approaches from the left. 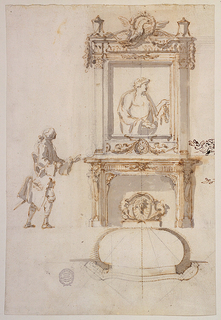 Below is the plan of the mantelpiece and fireplace.